Our street was swept early Tuesday morning. Two neighbors were out at 7:30 a.m. picking up debris from parkways and sweeping garbage on the street into piles to make it easier for the street sweeper. 48 hours after street cleaning. same time plastic forks were tossed into the middle of the street. Just before 6 p.m., I watched a man park his van, pick up his groceries, look at his receipt, and toss it into the street. 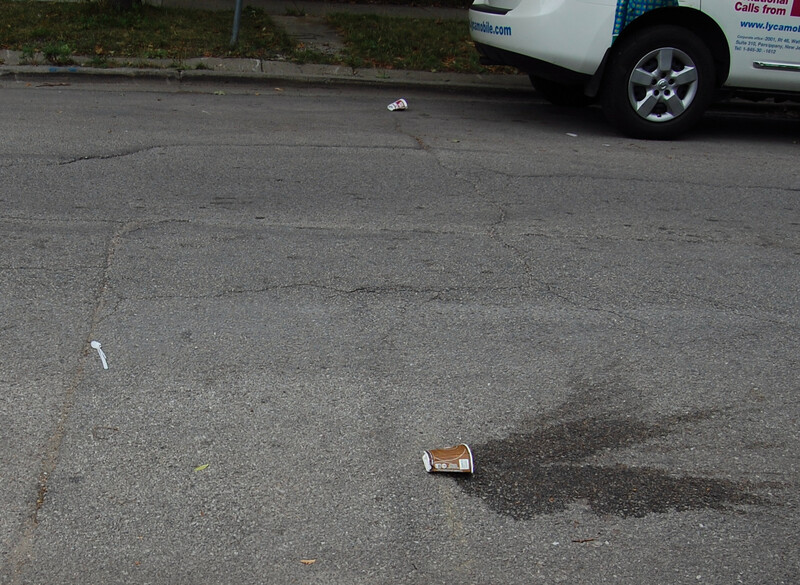 The next morning, walking the dogs, I found two coffee cups and one can that clearly had been dumped by people exiting their vehicles on our just-cleaned street. Why are people such pigs? Why is it that some people don’t care if they live surrounded by garbage? What is it about trees and grass, bushes and flowers that triggers the impulse to dump garbage? Never pick up what you drop. 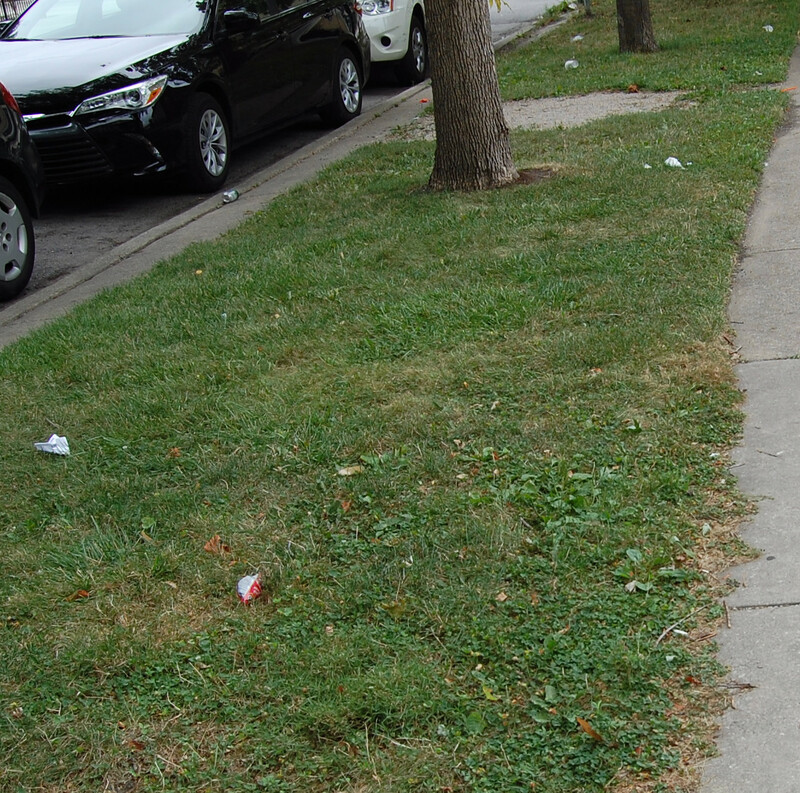 Cans stuck in bushes or on tree branches, water bottles everywhere, food garbage on the ground outside apartment buildings—what kind of people are moving into West Ridge? Sanitation standards are at an all-time low in this neighborhood. I’ve seen people sitting together sharing peanuts, all the shells dumped on the ground. Parents no longer pick up after their kids. Whatever’s dropped stays on the ground, even if there’s a trashcan just inches away. Bus shelters with seats are usually filled with food debris—check out the bus stops at Devon and California some morning. Or note the mess at Western & Devon. California from Devon to Granville looks like a pigpen–papers, bottles, cans, food, food wrappers, plastic containers, and other junk. It’s true that a significant amount of garbage is deposited on side streets by nonresidents parking there to avoid paying the meters. 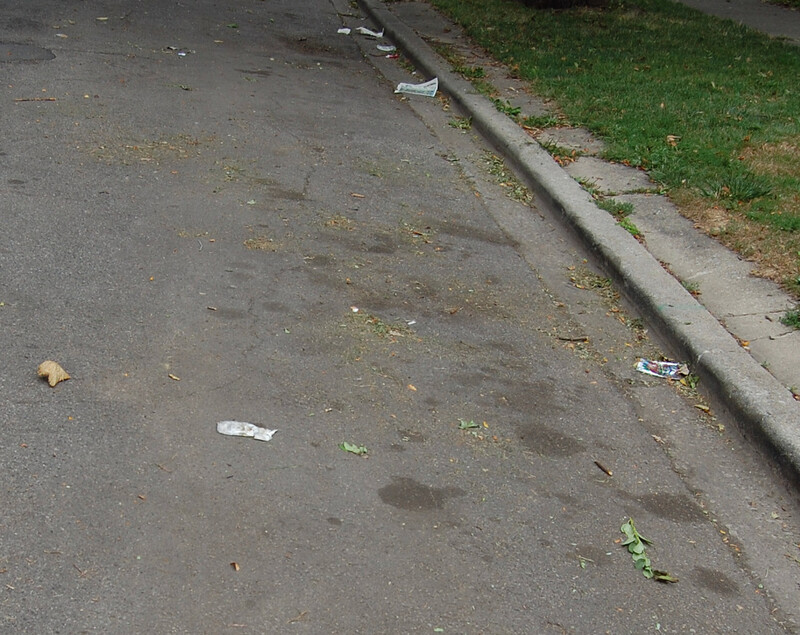 Why free parking makes people feel entitled to dump garbage is unclear. But most of the garbage on our side streets and in our parks comes from our neighbors. An army of sanitation workers could not keep our streets clean. Too many people don’t care about basic cleanliness, don’t care about rats, don’t care how dirty they are or how dirty they make the neighborhood. Respecting other cultures does not mean lowering our own American standards. It should mean teaching newcomers the basic standards of sanitation that led to the eradication of disease, rat and pest control, clean streets and parks, and a decent living environment. People who don’t want to clean up after themselves, and landlords who permit their buildings to become garbage dumps, should be invited to live elsewhere. Too many businesses also need to clean up their acts. Do stores and restaurants really expect customers to wade through garbage to get to the front door? It’s time to get the pigs out of West Ridge. The garbage pits on and around Devon are such an ongoing problem that they’ve earned their own page. I will be posting photos regularly. Both residents and business owners need to learn about proper trash disposal. They don’t understand basic things: household trash goes in the dumpster where you live, not in street corner trash cans and not under trees. Businesses earn a tax deduction for refuse disposal, so business trash, especially boxes, does not belong in street corner trash cans but in dumpsters behind the building where the business is located. Please–break the boxes down so more trash will fit in the dumpster. I’ve noticed over the summer months that much of the trash in the pits and on the street itself is beer cans and beer bottles, which suggests that there is open public drinking or drinking and driving. Both are illegal. Liquor, including beer, should be consumed only indoors, so patrons leaving restaurants with cans and bottles are breaking the law twice, once by drinking in the street and a second time by littering. What Devon really needs is police on foot patrol. They can nab the drinkers and the louts who park in bus stops, especially the ones who keep the blinkers on and spend an hour or more inside, shopping or eating. Ticketing illegal drinkers and illegal parkers would be good for residents. I’m tired of seeing senior citizens forced to get off the bus in the middle of the street, struggling to get themselves and their walkers out of traffic, all because some arrogant idiot feels entitled to park at the bus stop because his restaurant or grocery store is nearby, and he/she doesn’t care about anybody else. Friday’s Zoning Board of Appeals hearing was an interesting lesson in Chicago politics. Despite a well-reasoned, thoughtful, thorough presentation by Bob Kingsley and his attorney, Thomas Moore, the Zoning Board of Appeals gave only tentative approval for the opening of the Green Gate Compassion Center at 6501 North Western Avenue, next door to Warren Park. For awhile, it appeared that the Board would defer to Ald. Silverstein and a well-rehearsed if bewildered supporting cast of wide-eyed children and deny Mr. Kingsley’s application. If supporters do not continue to press for approval, that is exactly what will happen. The vote is currently 2 in favor, 1 (plus the alderman) opposed. Only one other member of the ZBA is scheduled to review the transcript and exhibits. If that person votes against, the score will be 2-2. Does that mean another hearing packed with kids? There were three applications for medical marijuana dispensaries before the Board, the 50th Ward’s being last on the agenda. What happened with the first two was a clear indication of how things are done in this City. It’s well-known that aldermen control zoning in their wards, and that it’s next to impossible to obtain a zoning change if the alderman is opposed. Just ask Zehra Quadri. First-term Alderman Napolitano of the 41st Ward, to the surprise of the attorney representing the MMD applicant for his ward, Union Group of Illinois, asked for and was granted a continuance because the alderman felt he hadn’t yet gauged the sense of the community on the issue, despite a continuance on this matter from May and an entire summer in which he could have done so. Is public support running against the alderman? He didn’t say. Although the attorney protested that Union Group had been given no notice that the alderman would be seeking a continuance, and had flown in witnesses to testify before the ZBA, and was fully ready to present its case, the Board ruled for the alderman. Next up was Harborside Illinois Grown Medicine, which sought approval to operate in the 8th Ward. The City Council chamber was packed with over 100 residents from the 8th Ward, the majority carrying commercially-produced signs in opposition. A hand-count by the ZBA toted up 35 residents in support, and 65-70 opposed. Despite a forceful statement by an 8th Ward resident and attorney in support of the proposal, the case was continued until November 20. One of the concerns raised by opponents was the alleged criminal background of the applicant. Another was the fact that the community felt the dispensary applicant had not appeared at community meetings to discuss the proposed business. The Board’s chairman, Jonathan Swain, speaking to the attorney, noted that, “at the May hearing, you didn’t have any opposition. Now you do.” The alderman for that ward said she’d listen to the community. Case continued. The 50th Ward was next. All objectors were asked to move to the right side of the room to prepare for testimony; the five adults and 7-8 children did so. The kids had moved to seats behind me while we waited for the session to start. Only the oldest boy—about 10—could read well enough to find the 50th Ward hearing on the agenda. I turned around asked the kids why they were there. They said their uncle brought them. I asked if they opposed or supported the dispensary. They were firmly opposed, but didn’t know why. The oldest boy offered that “they want to put a drug store in my park.” The kids then went for their uncle. He had been at the May meeting, was warmly greeted at that time by the alderman, but would not speak with me. This time, he told me that he fears for his children if the dispensary is permitted. He had no qualms, however, about using his children as stage props, rehearsing and coaching them to speak on adult matters they couldn’t possibly understand. Indeed, except for the oldest boy, they were there simply to represent the loss of innocence that their families are sure will occur should medical marijuana be sold in a safe and secure building alongside the park. The families did not express any fears or knowledge of the illicit drugs presently available in that same park or, indeed, throughout the 50th Ward. Swain began by noting that the City’s Department of Planning had recommended approval of Mr. Kingsley’s application. The alderman was invited to speak her piece, and she said that the application was “somewhat controversial,” that calls and emails to her office indicated that residents were “equally divided” pro and con, with very strong opinions on both sides. Then it was Mr. Kingsley’s turn to present his case for approval. Nothing would indicate that the building is a medical marijuana dispensary. No signage would say anything other than the dispensary name, Green Gate Compassion Center. Vehicle entry is through a boom arm, exactly the same as what’s used at parking facilities and banks around the country. Admission to the building itself will be controlled by an armed security guard, who will permit only patients and a parent or parents (in the case of a pediatric patient) into the facility. Admission is by fingerprint ID only. Patients must also have the State-issued MMD card and a valid prescription written by an Illinois doctor. The MMJ is in locked cases, and stored in a vault at night. Trucks delivering MMJ would do so via a locked and fully-secured sally port required by the City. Staff will be searched by guards when leaving for the day to ensure that no inventory leaves with them. Thillens has agreed to handle the dispensary’s cash. It will be recorded in such a way that it becomes Thillens’ property on intake. Kingsley is currently in discussions with Millenium Bank in Palatine and First National Bank in Springfield to handle noncash transactions. Currently, Federal banks will not accept deposits from MMDs. Kingsley is working on setting up a debit card arrangementt for his patients. Both the head of security and the designer of the dispensary’s security systems spoke about the extensive attention paid to safeguard patients and inventory, which will be counted every day and secured in a vault every night. The opponents were next. The first three spoke in Spanish, with translation provided by the Board. Two of the speakers were related to the children now sitting behind them. They insisted that the MMD would imperil their children, that just walking past it on their way to the park would endanger the kids. They kept repeating that kids are curious, that they would want to know what the building is and what the people going inside were doing there. They are convinced that patients will go directly into the park and smoke marijuana, and would toss the roach butts on the ground for the curious children to pick up. One speaker said she supports medical marijuana but doesn’t want the dispensary near the park. The children’s uncle wanted to know if anybody would want an MMD next to their home. He claimed that the MMD should not be a business decision but a decision about children and their future. The oldest boy, later in the hearing, after visibly being coached by his family, broke into the pro-dispensary testimony to beg the Board not to approve the MMD, claiming that he is “scared of strangers and scared to say no” if patients try to force him to take marijuana. He backed up his uncle’s claim that he would be afraid to walk to the park past the MMD in case patients tried to force their marijuana on him. Not surprisingly, the alderman chimed in to say that it occurred to her that many parents would stop bringing their children to the park if the dispensary were approved. Both claims are preposterous. Annie Sindlear, a resident whose children accompanied her to the hearing, pointed out that all the security at Green Gate couldn’t help but make the park safer, and that she had no fears for her children. Another issue raised by opponents and the alderman is that there are three playgrounds in the park that might be harmed by the presence of the dispensary. Supporters noted that two of the three playgrounds are on the north end of the park, at Pratt, and the third is far enough north of the dispensary and east of Western that no possible harm could be inflicted by the presence of the MMD. [The MMD would be closer to Arthur & Western, with the Pratt playgrounds more than two blocks north.] Indeed, opponents were unable to demonstrate any way in which the dispensary could harm children or adults. Another speaker expressed concern for seniors, saying that increased traffic brought to the park by the dispensary would endanger seniors crossing the street. Speaking as a senior myself, I must say that we have a lifetime of experience crossing the street, are usually more careful than younger people who tend to dart into traffic, and are quite apable of managing to cross busy streets. One neighborhood resident claimed that the MMD would be in an “isolated” area with lots of trees and bushes where unsuspecting patients would be ambushed by thugs for their cash on the way into the dispensary, and their medical marijuana on the way out. She claimed that there is little pedestrian traffic around the proposed site of the MMD. This claim makes no sense whatever. Opponents can’t have it both ways. If there’s no foot traffic, how are people, including children, getting into the park? Does everybody enter at Pratt? If so, then what’s the problem? They won’t be passing the dispensary building anyway. The truth is that anyone can buy pot in Warren Park right now, along with a wide variety of other drugs. I’ve noticed that the police have recently made arrests involving heroin, and that’s of far more concern than the sale of marijuana for medical purposes. Maybe the alderman’s next multijurisdictional task force can target the park and get rid of the illicit drugs sold where children play. Speaking in support, Peter Sifnotis, Executive Director of POWR (People of West Ridge), made a case for the economic development the MMD would bring, stressing Mr. Kingsley’s commitment to hiring veterans and the disabled from the two wards in his licensed district (the 49th and 50th). He briefly reviewed the reasons for the legalization of medical marijuana in Illinois, and noted its success in treating a wide variety of diseases. Sifnotis also presented the Board with a petition signed by more than 155 neighborhood residents in support of the MMD. The Epilepsy Foundation of Chicago submitted a letter in support of the dispensary, and its representative briefly spoke of its benefits for patients. It’s unclear why the alderman is so determined to block this initiative. She claims to support the use of medical marijuana, yet manufactured a concern about children playing in the park in an effort to prevent the dispensary from opening. She has enlisted he support of well-meaning but clearly uninformed families to lead the charge. Opponents are emotionally invested in looking after other people: It’s about protecting the children. It’s about protecting seniors. It’s about protecting the patients. In reality, it’s about protecting themselves from a changing world they don’t quite accept or understand. One speaker claimed that he feared medical marijuana would lead to heron use. It’s the old if-then theory dressed in protective clothing: If this is permitted, then people will want that, and we’re not going down that road. Except that we are. Pot will be legalized—and taxed–in the near future. Once that happens, the federal banks will get on board because the money will be too much to resist. Once the banks start to accept checks for pot, there’ll be a momentary cosmic shiver, and then the world will settle down again. As with tobacco, legalization will provide research subjects, and people will be able to make informed choices. And the children will still play in parks, oblivious to it all. This morning shortly after 6 a.m. the noisy set-up for the India Day celebration began in the Republic Bank parking lot. Once again, there will be an over-amplified hours-long concert. Once again, political muscle–and money–have triumphed over common decency. Once again, the event’s organizers have openly expressed their contempt for nearby residents. This being Saturday, neither the DCASE offices nor the alderman’s office can be reached, and since both signed off on this disrespectful production it’s doubtful either would stop it. Part of the DCASE application asks about noise and its control: “Will electronic sound amplification equipment or a public address system be used at the event? If yes, Indicate, on the Site Plan, the location of the stages and sound systems, the location and direction of all speakers, and the proximity to residential addresses.” The application also asks for the hours during which the amplified noise will occur, and what plans the organizers have for controlling the noise. 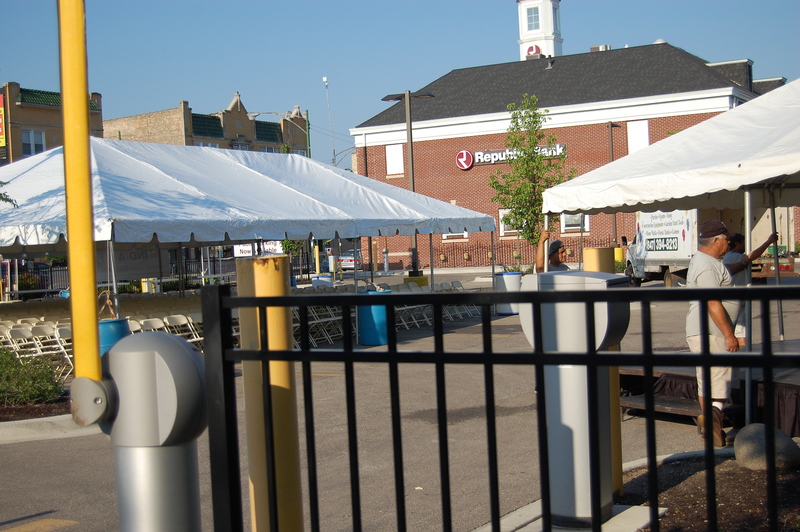 I don’t know what the organizers told DCASE, but they set up their soundstage directly across the alley from residential housing. 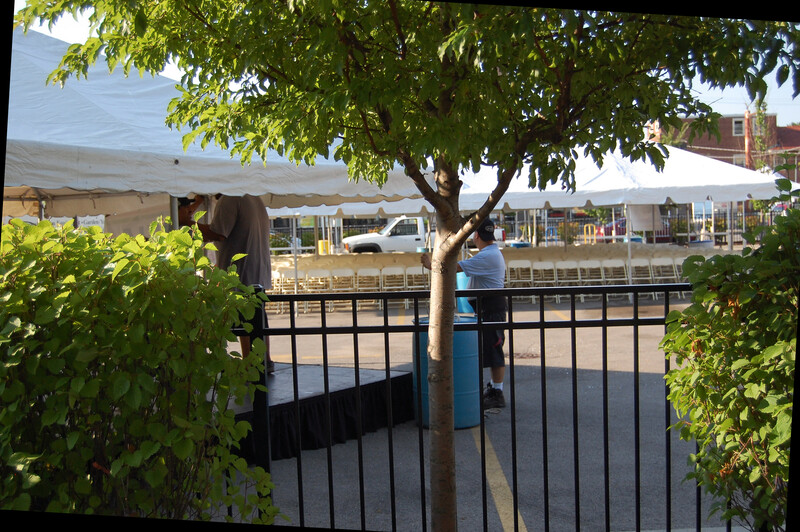 Were the organizers, DCASE staff, and the alderman indifferent to the placement of the soundstage? Yep. It’s not outside their homes. Final set-up for audience and soundstage for 2015 India Day celebration in Republic Bank parking lot. Note that soundstage is directly in front of residential housing, separated only by an alley. Audience seats set up facing residential housing on Washtenaw. Sound stage and amplifiers are in far northeast corner of the parking lot. Soundstage being erected in far northeast corner of parking lot. 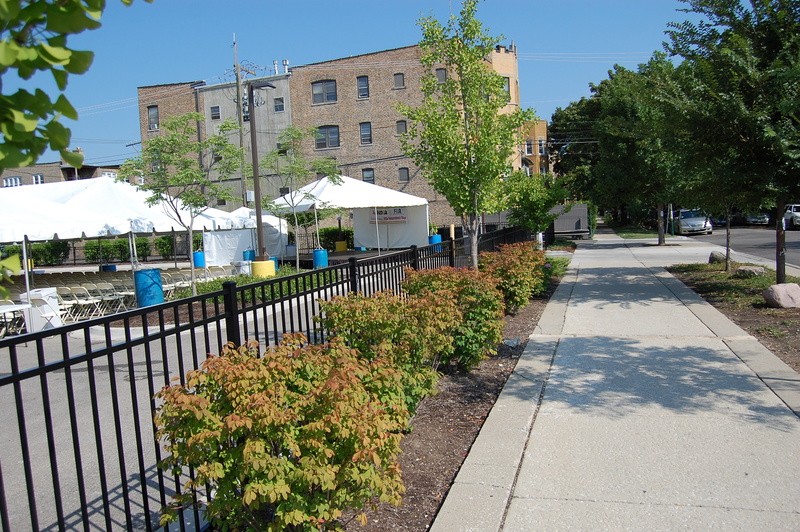 Can you imagine an audience area and sound stage being set up outside the alderman’s home? Or anywhere in her end of the neighborhood? Do you think the organizers of this event would tolerate this outside their homes? Of course not. It’s something the powerful and politically-connected impose on others but wouldn’t tolerate themselves. Last year’s celebration was handled in the same way. This year, too, there was no advance notice to the residents. No publicity of any kind. Oh, wait. There were posters in some storefronts along Devon that advertised the parade and stated that the Mela (party) would take place in Warren Park beginning at 2:30 p.m. Warren Park? Devon & Washtenaw, 8 a.m.
Look closely at the poster. Just left of center it clearly states that the mela will be held in Warren Park. Did the residents of that pricey area complain? Would the noise be too much for the golfers? Or was it a feint, with the fest planned for the parking lot all along? A required part of the application is a letter from the alderman stating her awareness of plans for the event; the application has to be submitted 45 days prior to the event. That makes it clear that this event was never intended for Warren Park, nor did its organizers have any intention of notifying nearby residents that it would occur in the parking lot again this year. After all, it’s not like the residents on Washtenaw and Fairfield and surrounding areas north and south of Devon have anything to say about being blasted out of their homes for an entire day. Residents don’t matter. The organizers of this event would not accept such disrespect from the eighty percent of West Ridge that is not Indian. Indeed, any and all criticism is immediately denounced as racist and intolerant. But for the India Day organizers to disrespect the non-Indian community? That’s a different story. The big India Day celebrations and parades this year will take place in the suburbs, in Schaumburg and Naperville, with events also scheduled in Lisle and Hoffman Estates. It may well be that we’ll be seeing an end to the disruption demanded by events like this held on Devon and residential side streets–the bus reroutes, the sidewalk closings, the street shut down for hours for a fast blast of tacky floats, some of which aren’t even identified. As the neighborhood evolves, it may outgrow the notion that we need events like this to draw tourists to businesses that don’t want neighborhood residents as customers. We are currently witnessing the slow death of exclusionary retailing on Devon, and this annual event may also be in its death throes. To willfully disregard the impact of an event like this on residents is wrong. The Silverstein are counting political contributions, not defending the right of residents to be undisturbed in their own homes. The alderman should serve as a buffer between event organizers and residents who will be directly affected by noise, traffic, and garbage problems. If any such event were scheduled for the area north of Pratt, there would be a community meeting with the event organizers to discuss protecting the rights and property of the residents. Those of us who live closest to Devon don’t get such service. For two years in a row, information about this event has deliberately been kept from that part of the neighborhood most affected by it. The Federation of Indian Associations (FIA) of Chicago should be ashamed of itself for treating members of the West Ridge community with such arrogance and disrespect. So should the alderman, and the management of Republic Bank of Chicago. For a look at last year’s event, click here for pictures and here for story. Devon, Western to Whipple. Every block defaced by open garbage pits or street corner trashcans filled with household garbage. Worse, the new seating areas encourage people to sit, talk, and snack, but lack trash receptacles, so the planters and nearby garden areas serve as dumping grounds for water bottles, coffee cups, food containers, chip bags, and cigarette packs. This is true even for those seating areas west of California, the area that was completed first. It’s simply disgraceful. All pictures were taken Tuesday morning, August 11, 2015. Bad as this is, other garbage pits on Devon are worse. Does anything other than household garbage go into the trashcans on Devon? The flowers help hide the garbage. Lots of open food garbage in here. How thoughtful of people! Coffee cups, water bottles, household garbage, and open food. I didn’t find a single tree on Devon that didn’t have garbage at its base. This garbage pit is directly behind an unfinished seating area. Planter used as trash bin. Where’s the Board of Health? People should not be sitting directly in front of open trash pits. There are trash cans nearby, but dumping here is easier. This mess has a little bit of every kind of trash imaginable. Doesn’t this make you wonder how people live in their own homes? To be fair, so many residents dump their household garbage in street corner trashcans rather than in their own dumpsters that there’s almost no room for anything else. This household trash belongs in an alley dumpster, not on Devon. Businesses use trashcans for disposal of business trash even though they get a tax deduction for trash removal. Some people are just pigs. This box appears to come from a nearby restaurant. The box didn’t fit in the trashcan overloaded with household garbage. Some people don’t even bother to seal their garbage bags. This box was sent from Pakistan to a Skokie man. It was filled with clothing for men, women, and children. I know this because the label was left on the box. Does the man own a nearby business, or was he just cleaning out his car? The new seating areas lack trash cans so trash winds up in planters, on parkways, and on the ground. Then there’s the unfinished seating area below that clearly demonstrates what could happen if trash cans are added to seating areas. Garbage behind seat and in planter. Seating area defaced by graffiti and sticker. Same area, another seat, another sticker. No trash can, garbage goes on the ground. This area has it all–graffiti, stickers, and garbage. Seating areas need trash bins, but would we wind up with something like this? Tomorrow, Tuesday, August 11, at 6:30 p.m., Ald. Silverstein is hosting a community meeting with Bob Kingsley, the owner of the medical marijuana dispensary proposed for 6501 North Western Avenue. Some of the staff of the dispensary, the Green Gate Compassion Center, are also expected to attend. Both supporters and opponents of the proposed dispensary are expected to turn out for a full discussion of issues related to the business. Among the issues expected to be raised are the facts that the business is cash-only, that it requires round-the-clock, seven-day-a-week security, and that it would be located next to Warren Park. The alderman has been clear that her opposition to the dispensary is based solely on its location next to a park where children play. She has met privately with Mr. Kingsley over the summer to discuss her opposition. The community meeting is a result of those discussions. It was revealed today by the Chicago Sun-Times that, as part of the state’s budgetary crisis, all seven state investigators charged with overseeing both the growers and the sellers of medical marijuana have been laid off. Their contracts may be renewed once the budget battle has been settled but for now oversight will be handled by other staffers. Mr. Kingsley has said that he will hire neighborhood residents to staff the dispensary, especially the disabled and military veterans. The business will generate sales taxes. Mr. Kingsley’s proposal includes a full redevelopment of the site. Both the site renderings and a petition in support of the dispensary can be accessed here. The petition referred to above will be presented at that time. Tuesday’s community meeting will take place at the Croatian Cultural Center, 2845 West Devon Avenue. Twelve vendors. One entertainer. Few customers. Not good. The alderman has once again claimed credit for police work that had nothing whatever to do with her. This “targeted operation” involved checking on parolees and those wearing court-ordered electronic monitors, arresting individuals for whom there are outstanding warrants, and “performing undercover vice operations.” She notes that the presence of so many police officers in the Ward makes us safe, and proudly claims this as the fourth such operation she’s “organized” since 2012. How police managed “undercover vice operations” in the midst of such an overwhelming physical presence she did not say. This kind of baloney appeals to the base, afraid as they are of anyone who isn’t them. But it’s absolutely ludicrous on its face. If it’s true that any alderman–let alone this one, a former accountant with no police background–can truly claim responsibility for planning and executing routine police work, then the City is in worse shape than we think. She may have loaned her office as a base for these operations. She may have been advised as a courtesy that this activity was going to take place. But to suggest that she had an active role in either initiating or planning these activities is ridiculous. This is routine police work and cops have successfully cooperated across jurisdictions for years without the interference of self-serving politicians intent on building reputations as crime-busters. She issued the same statement during the recent election campaign. Her Web site subsequently went through several iterations of it before her handlers settled on the claim that she coordinated these activities. It’s doubtful she did even that. Playing to the exaggerated crime fears of her political base may enhance her street cred at Winston Towers, but it makes her look ridiculous everywhere else.